Oh Jimmy Choo- you never let me down... But this post is all about turquoise, mint, royal, aqua, navy, sky, midnight-- BLUE and more blue. And, guess what? If you wear blue, chances are you will be far from "feeling blue". Actually hear me out on this-- it's pretty fascinating. Not only is blue a stunning color on both men and women, but did you know there was a Harvard study done on the power behind wearing the colors BLUE and PINK? Drumroll please: The study revealed that men and women, who wore at least one article of blue or pink clothing, found themselves feeling sexier, more confident and even less stressed. For real! Even if the women in the study just wore pink undergarments-- not for their boyfriend or significant other, but for themselves; all the women reported feeling a little extra sass in their step that day. They were truly happier! So why not give it a try? Yes, and pink includes all shades of pink. For instance, look at this beautiful blush-colored dress that Victoria Beckham is sporting. Looks pretty fab to me! 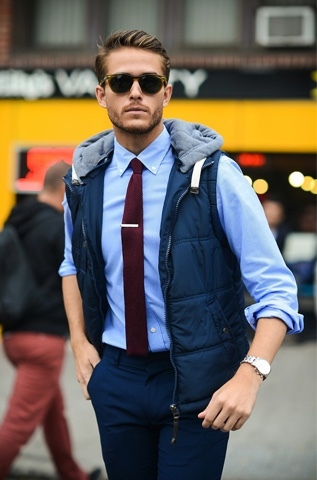 Or for the men, this look is fashionable without trying too hard! That's the key to all fashion- especially men's. You want it to look effortless. This soft blue button-down shirt is styled with ease as his cuffs are rolled up; altogether paired back to a navy outerwear vest and sleek navy slacks. I'd say it's all on point. Yes sir! Whether you believe this study or not, I'm not one to question "Harvard" scientists or even fashion for that matter. Heck, if you feel beautiful in what you wear, that's awesome-- you're halfway there. You truly cannot put a dollar value on the infectious power that confidence exudes. So without further adieu, you all know that I have been showcasing a few photos on various social media platforms with this STUNNING mint blue/green dress. It's Grecian perfection...truly the ideal amount of class, beautiful draping, elegance yet sexiness, as it tastefully shows a little skin. But did I mention how ridiculously affordable this beauty is? After tax and with your "Laurastyle" promo code discount, this dress is right around $70! Seriously...now we're talking. And I promise you that I haven't been purposely delaying showing off the details on this fabulous fashion find. Long story short, I wore this dress to brunch on Father's Day. After casually posting a cell phone pic on Facebook, the response I received via private messages, texts and e-mails was incredible! This dress literally sold out within minutes. So here's the great news: This dress will be available in the fall in "baby pink". I highly recommend that you shoot me an e-mail to get your name on the list ASAP: Laura@life-stylebylaura.com . I will be sure to update this post with the link to the web site to purchase once this dress is available. Stay tuned!!!! But for one moment, can we please revisit the whole concept of feeling beautiful in the clothing we wear? Yes, great clothing goes a long way, but true beauty lies in how you showcase your own personal style. After all, fashion is not a trend. Fashion and style is how the world sees you. How do you want the world to see you? YOUR personal style is something you develop and fine tune over time, and that's what makes your look fun and memorable. As far as my personal style goes, I'm all about mixing warm and cool tones. And so I chose to style this dress with my black Hèrmes "dog collar" cuff, strappy bandeau for moderate coverage, and my favorite Kori Green sunstone necklace. Are you familiar with Kori Green? Look at some of the beauties I snatched for my clients (and me) during her recent trunk show in Dallas! 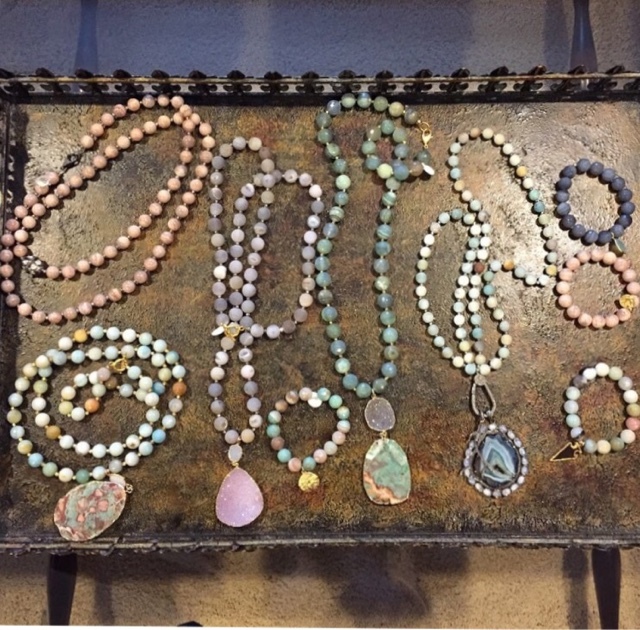 Kori Green is the wife of country music star, Pat Green, and her jewelry is out-of-this-world beautiful...just look at it! And if it wasn't for one of my favorite Dallas designers and mentors, Abi Ferrin, I never would have been introduced to the stunning Kori Green collection. The Abi Ferrin boutique in West Village (Dallas, TX) is constantly showcasing amazing established and up-in-coming accessory designers in exclusive trunk show events. You can purchase any piece from the Kori Green collection via the Abi Ferrin boutique. And you know what that means for you? Yes ma'am. Anything you purchase at the AF boutique (be it Abi Ferrin's stunning ready to wear--like the royal blue dress showcased in one of last weeks' posts) or jewelry from various accessory/jewelry designers like Kori Green (and Opal Milk by Rye), you will receive an awesome discount. Just remember to mention promo code "Laurastyle" or that you heard about these items on my blog.